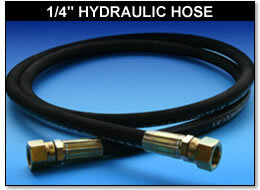 Our 1/4” and 3/8” R-17 hydraulic hose is rated for 3500 PSI working pressure. Its rugged wrap cover, steel wire braid construction has a 2 wire strength to help resist wear and extend product life. Plow with confidence knowing our hose will stand up to all your plowing needs. Can't find what you need? Call us to order.